The DS689 Infrared Sauna Dome is an affordable alternative to the NASA inspired FIR Hyper Thermal technology. Like its more expensive big brother, the DS689 offers close range FIR with temperature control over the whole body, which is the key functionality that makes sauna domes an ideal and effective modern hi-tech system that is used in beauty salons , weight losing centers and even at home. This FIR home sauna dome combines health care and slimming function without any negative effects on human body and in conjunction with its affordable price has made the DS689 the ideal Hi-Tech health care equipment for family purpose. It adopts first-class intelligent control technology over the whole blanket, to effectively give an even distribution of thermal heat over the entire blanket in a short period of time. DISCOVER THE BENEFITS OF FULL-BODY FAR INFRARED RADIANT HEAT! THE PORTABLE DOME SAUNA MAXIMIZES INFRARRED WAVE TECHNOLOGY. FIR heat provides all the healthy benefits of natural sunlight without the dangerous effects of solar radiation. The Far Infrared heat produced by the Portable Sauna Dome is able to penetrate well below the skin, allowing the body to sweat at air temperatures of 110 - 140 ° F (lower than conventional saunas). 1. Assemble the Sauna Dome tent, and plug in. 3. Press "ON/OFF" to "ON" to start. 4. To set up time, press"TIME UP" and "TIME DOWN" from 5minutes to 30 minutes. 6. Press "BLANKET" to make blanket heat up. 7. Press "HEATER" to make ceramic heater heat up. The bed blanket is covered with Carbon Fiber FIR heating elements. The ceramic heater which is included is placed on the bed pad, and works extremely well in very cold weather. When the FIR Sauna tent heats up to 45 ° C (110° F), the FIR materials can emit 95% of energy as heat. It takes only 5 minutes to reach 45 ° C (105° F) constant temperature. The INFRARED SAUNA DOME DS689 leaves your head and hands free while you pamper yourself with a calming sauna at home, or anywhere.The portable sauna dome warms quickly, yet gently, with foot side super-conductive heating elements plus a floor bed pad, giving off soothing FIR heat. Assembly and re-folding for storage are quick and easy. 1. Put the Blue Heating Pad on the middle of the Silver Mat. 2. Put the Ceramic Heater on the foot area of the Silver Mat, and put the Control Box at outside of the Silver Mat. 3. Remove 4 Screws sticked under the Ceramic Heater and screw tight with Tent Frame, which is inside of the Tent. 4. Loose the connecting Straps on the Tent, and spread completely. Tie up the Sauna Dome Frame with Tent. There is a hole for foot part, and the curtain is for head part. Notice: The Control Box must be outside of the Tent. 2. Plug Portable Far Infrared Sauna Dome into electrical outlet. 3. Press the POWER switch once to activate the Portable Far Infrared Sauna Dome. Press "ON/OFF" to start heating.TIMER button to set for 10, 20 or 30 minutes. Preheat 5-10 minutes first. 4. 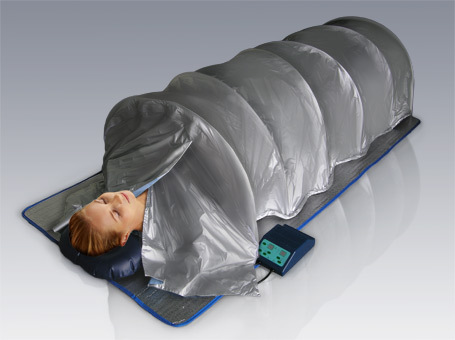 After lie inside the Portable Far Infrared Sauna Dome, close the curtain. Length 200 cm / 80"
Width 92 cm / 36.8"
Height 50 cm / 20"
52 x 88 x 23 cm / 20.8" x 35.2" x 9.2"